I haven’t seen that many Miyazaki films but I must say that I’ve liked all the ones I’ve seen therefore I wish I had seen more. It’s not a wonder that these films seem to transcend the typical limits of appeal and tend to reach rather broad audiences not just niche fans. It’s similarly not surprising that Disney has partnered with Studio Ghibli as the Japanese company’s US Producer/Distributor. The animation in this film is rather beautiful to look at and very well composed. It is great evidence of the flexibility and variety that the medium still offers despite some prevailing trends. Perhaps more so than other film media animation still has within it the most diversified and varied employment of techniques and this film is evidence of why. It looks great. Similar to the Toy Story films this story plays much with the theory of size by portraying small characters in a world that we don’t perceive as massive. It’s a boon to imagination and engages you in a different way and it allows you to view a seemingly normal world that you see everyday but you see it in a completely different way, a way you never saw it before. It makes the story to an extent more plausible but also more engaging because it’s making the mundane magical. Now as is the case with many animated films when they travel overseas this film is dubbed. Now, I will say the performances by the English cast are pretty good. The leads being Bridgit Medler, David Henrie and Carol Burnett the only thing I found a little off was a lot of the vocalizations (grunts, sighs, onomatopoeia), which can sound unnatural and could’ve been omitted in the US version, were kept because they’re stylistically accurate and expected. So it’s the scripting I struggled with not the actors. The story is based on the novel The Borrowers and it seems to be a well-handled version and it’s an interesting and inventive treatment of one of life’s minor mysteries (“Where did that thing go?”). Playing off the concept and the theory of size there are great situations and tasks set forth in the film. The narrative is a simple but enjoyable but that suffers no unnecessary complications but instead progresses with the temporal elasticity of a Disney classic. The film does all it can to separate and reunite this newfound friendship and concludes in a very touching and proper way. 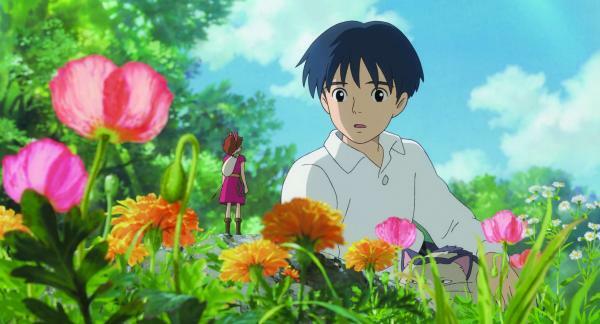 It’s a great animated film that might introduce some new audiences to Miyazaki as well as Disney’s own Winnie the Pooh did.